Here are the details of business and finance bingo. This game is designed to practise business and finance terminology. Playing business and finance bingo in ESL classes is very simple. Each student is given a bingo card or bingo worksheet containing a different random selection of business and finance terms, and a marker pen (or set of counters). 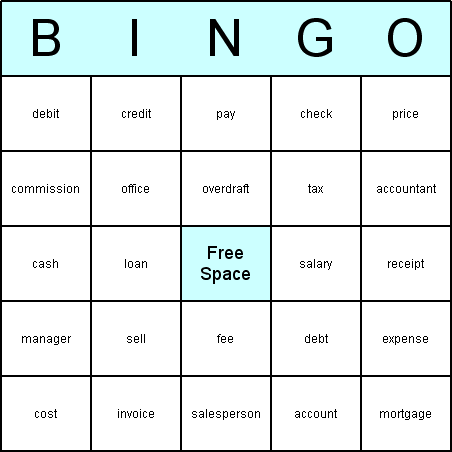 Here are some free printables for playing business and finance bingo. They include a call sheet (for the teacher to use for bingo calls), and a set of 8 bingo cards to give to the students. The bingo caller could read out a description or definition of each business and finance term (example: "the money that the employer pays to each employee in return for their work"), instead of the word printed on the bingo card (in this example, "salary"). The business and finance bingo printables on this web site were produced using the registered version of the Bingo Card Printer software. You could easily make your own bingo games using the same method. You can download the settings file bingo_business_and_finance.bcp by clicking here. Save the file to a folder of your choice on computer.